Sleep is so important to adults and kids. Terrible sleeping will destroy our life. Our teeth guard will bring back to you a silent night and best sleeping time. 1.Teeth guard will release our pain caused by teeth grinding, give us a quiet great sleeping and wonderful dreams. 2.Teeth grind will make kids feel bad and anxious, they will no good emotion to go to school, tired for teeth brushing and eating. 3.Adults will be whiny and anxious because of teeth grind too. 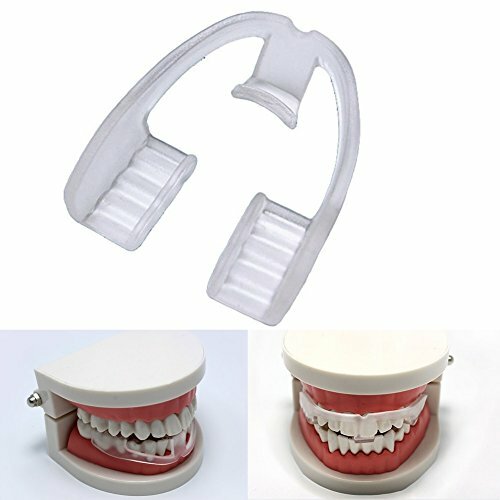 It will destroy our lover's sleeping, make both of us no good feeling when day time coming.Teeth protector will help us to avoid this. Perfect for family use or gift to others. Give the best sleeping time to our kids,lovers,parents,friends and ourselves. To help everybody to avoid teeth problems. 1.Mix cleaner with normal temperature or cold water to soak the mouth guard first around 5mins. 2.Take out and use clean cold water to clean the teeth guard. 3.Now you can put it on upper or inferior teeth. enjoy a good sleep. 1.Please do not use hot water to clean the teeth guard. It will be deformed by high temperature. 2.Drink a cup of water before use it and sleep to prevent thirsty. Close against teeth guard slip away. 3.It is normal situation when your teeth feel tired or little pain when you wearing the guard for the beginning of 3-7days, next days will turn to be well. 4.When day time come, you take off the teeth guard, please clean it and put in a clean box. 1.The images are 100% real product shot. If you have any questions about this product by MeMo Toys, contact us by completing and submitting the form below. If you are looking for a specif part number, please include it with your message.